Kitty told us a little while back about about make-your-own noodle soups at Cattle Cafe. So when we were on our way back from a nice Seattle weekend getaway and jonesing (as usual) for our first taste of Chinese food in a few days, and NPY wanted to go to a cooler place with our friends than No. 9, I suggested Cattle Cafe. 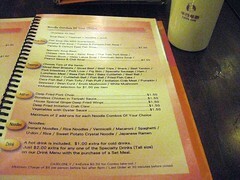 For just $7.50, you can build your own noodle soup and get a hot drink. First, you choose one of seven soup bases. I chose Malaysian laksa soup (which turns out to have been recommended 2 for 2 on FourSquare) while I also really wanted to have chicken herbal soup or peanut sauce & chili soup (擔擔麵). 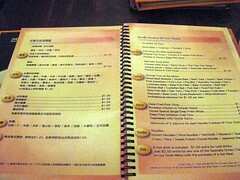 Then you choose two from the 27 ingredients including vegetables, meats, and seafoods. I chose luncheon meat and pumpkin slices… because I’m weird. The soup automatically came with sliced king oyster mushrooms (nice touch! ), nappa, and fried tofu puffs. Then you choose one of the 9 noodles and I went with instant noodles (a close second choice was the “crunchy” rice noodles, 米線). The soup noodles combo price was on par with elsewhere but the portion was generous and I value even more the ability to personalize based on my mood a given day… even if I usually make the most unusual choices. I can’t wait for my next visit to make another bowl of noodles!